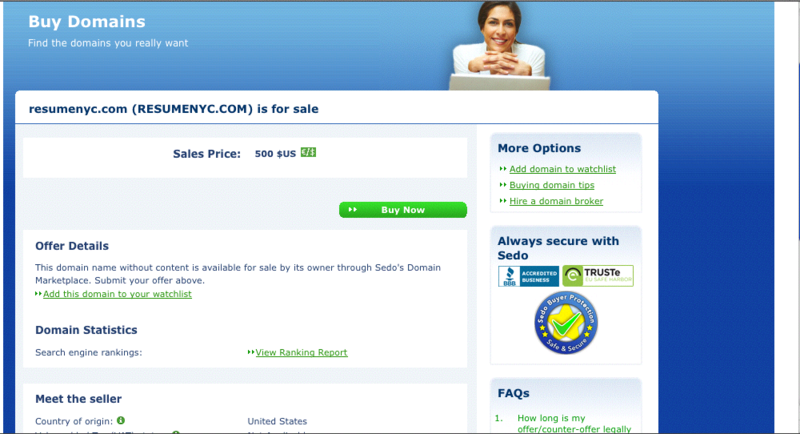 How hard could it be to sell a domain name? If hundreds of domain names can be sold every day, surely you can sell one domain name today too…right? Well, selling a domain name isn’t hard to do, as long as you know how to market it and get it in front of the right people — that’s the difficult part. Jason, over at Domaining Mojo, takes the time to share his experiences with his many readers. 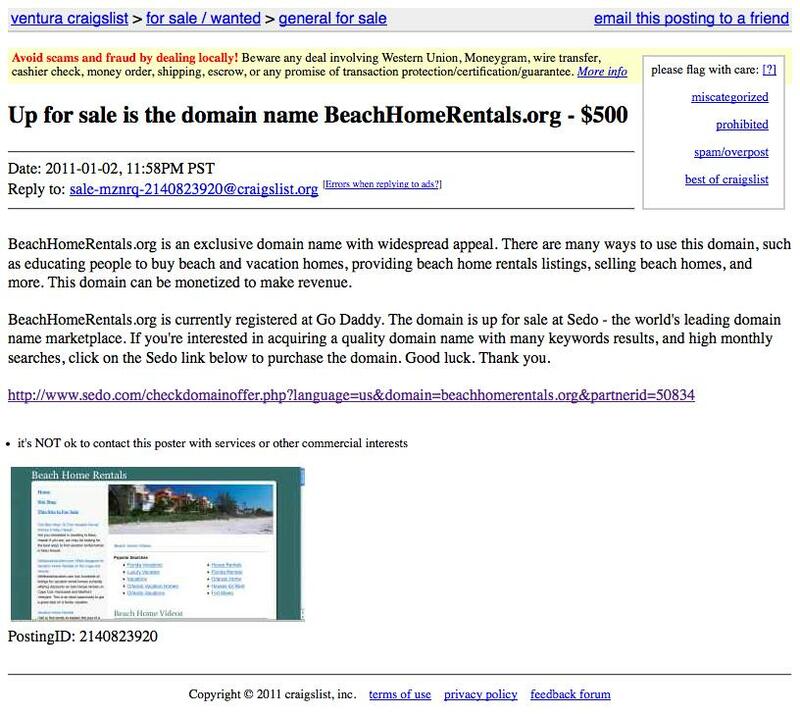 There are (what seems like) millions of websites to list a domain names for sale: eBay, DNForum, and a host of registrar-led marketplaces. But Jason decided to list his geographic specific domain name — BeachHomeRentals.org — on Craigslist.org, a network of online communities, featuring free online classified advertisements. Why would Jason choose Craigslist to list his domain name? Because Craigslist is a network of communities and each community has tens, if not hundreds, of thousands of online users specific to a geographic region, it’s the perfect place to list domain names that are also geographic specific (geo-domains). I agree that targeting vacation destination-cities along both coasts is the best tactic: anything from San Francisco down to San Diego on the West coast, and anything form Hilton Head or Myrtle Beach in the Carolinas down to the tip of Florida on the East coast would have a good opportunity. I’ll update this article with any information on the sale that Jason is kind enough to share. 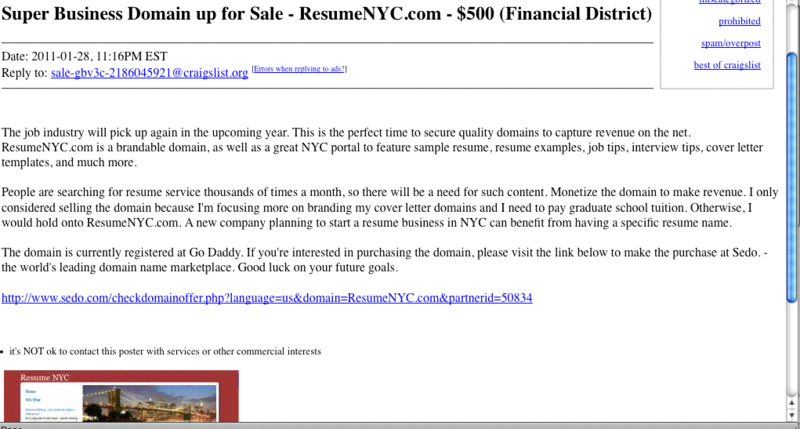 Thanks again to Jason at Domaining Mojo for this great tip and example geo-domain advertisement. UPDATE: Jason was kind enough to post a couple of additional samples: Pier39.info was placed in Craigslist San Francisco, and ResumeNYC.com was placed in Manhattan. The screen shots are included below so you can read the text. Do you have any recommendations on how to advertise your geo-domains? Post a comment and let everyone know. can you help me to sell .top domain names on your portal? I feel like craigslist is not sufficient since you are limiting yourself to a region . 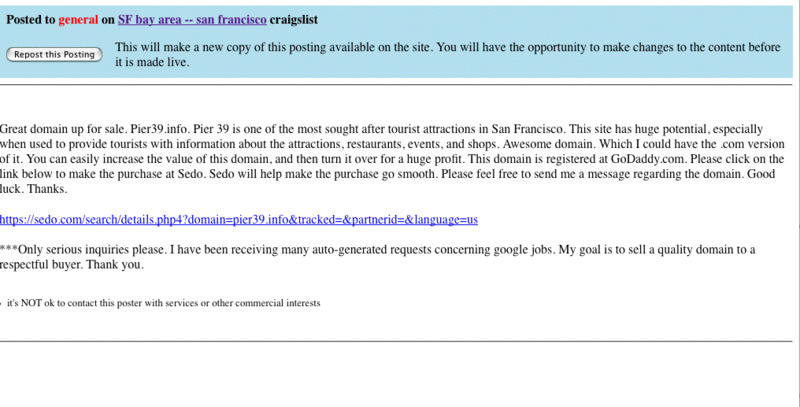 Further search engine work not too well with craigslist. Better is use Facebook along with sites like sedo. This is a good read! Thanks for the information. I appreciate the great article! You have done a great job building an awesome website. You inspire domainers to achieve their goals. Being persistent, patient, and professional will increase your chances to sell a domain name. Craig’s List will help you make a sale. GEO placement and pricing your domains right will attract buyers. Thank you Michael for the coverage. Good luck to everyone on making a sale. Thanks again.